Despite mostly positive reviews, a strong cast, and a crticially lauded director at the helm, Guillermo Del Toro's Crimson Peak flopped hard at the box office over the weekend, recouping just $13 million of it $55 million budget. Some critics have blamed the film's failure on its derivative marketing campaign, which painted Crimson Peak as another straight-up haunted house flick instead of the "gothic romance" tale that it really was, while others simply think that "gothic romance" tales just don't appeal to the same mass audiences that continue to gulp up Transformers movies like they are cinematic crack. In any case, Crimson Peak flopped, hard. Not Pan hard, but hard enough to be labeled as "Del Toro's Mars Attacks" by at least one critic. But when a movie fails domestically, international markets usually make up the difference, right? In Del Toro's case, the answer is an unequivocal "yes," as the majority of his films have fared much better overseas than here in the states -- with China usually leading the way. The only problem is, certain Chinese censorship laws may not only lead to Crimson Peak underperforming there as well, but being passed on entirely. 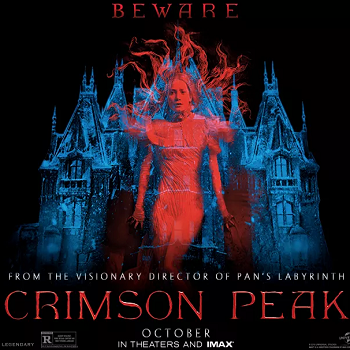 According to The Hollywood Reporter, the China Film Bureau's official censorship guidelines prohibit films that "promote cults or superstition," and as such, Crimson Peak has not yet secured a release date. "(The ban) stems from the Communist Party's secular ideology, which censors have used the provision as rationale for banning or demanding cuts to films that present ghosts or supernatural beings in semi-realistic fashion. Exceptions are made for stories based on Chinese mythology," writes the Reporter. Luckily for Del Toro, the deceptive ways in which movies are marketed here in the USA might very well save him in China. Chinese filmmakers have been known to employ inventive, if inadvertently amusing, plot devices to work around the no-ghost policy - deus ex machina as censorship dodge. Consider local horror hit The House That Never Dies, which grossed $65 million last year. Inspired by a well-known, purportedly haunted, house in the Chinese capital, the film follows a woman tormented by ghosts in her historic Beijing mansion - so far, unprecedented for modern Chinese cinemas. But then a final act reveals that all of the foregoing ghostly encounters have simply been hallucinations, because the heroine was secretly dosed with LSD. Other Chinese genre directors have used curtain-closing revelations of mental illnesses, bad dreams or hypnosis to skirt the rules. Basically, if Del Toro can slap a Shyamalan twist onto the end of Crimson Peak in *post* post-production, he might just make his (and his investor's) money back. Which, having seen Crimson Peak, shouldn't be that hard to pull off: cut out a few key expositive moments here and there, maybe eliminate the third act entirely, throw in some narration over the credits about how "it was all just a dream," and boom!, you've got yourself an international smash hit.